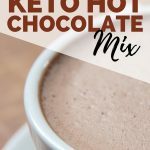 This homemade keto hot chocolate mix recipe is so easy and convenient. Keep it on hand to make a mug anytime – just add water! This keto hot chocolate mix is so easy. Did you grow up drinking Swiss Miss hot chocolate like I did? Oh man, the 80’s were a great time for convenience food! I love hot chocolate, but I don’t love taking the time to measure everything out just to enjoy one cup. Making this homemade keto hot chocolate mix makes it so much easier to whip up a cup anytime I feel like it. Lately, I’ve even been adding a scoop to my coffee, which is delish. 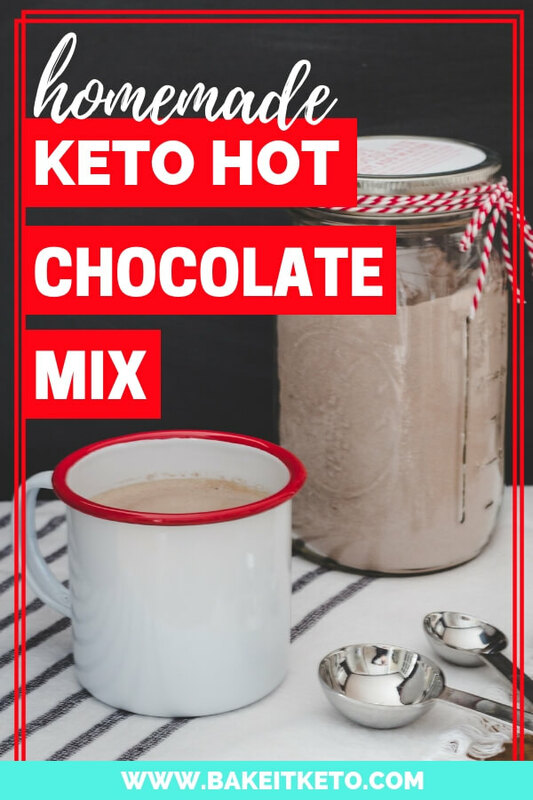 What makes this the perfect keto hot chocolate mix recipe? Most keto hot chocolate mix recipes will still require you to add hot milk. Not only is that too carby for me personally, but it’s way too inconvenient. This recipe has the heavy whipping cream built right in! Yup, we’re using a fantastic heavy cream powder, and it is so darn good. When I want to enjoy a hot chocolate at the ski lodge or when we’re out on the road, I just ask for a cup of hot water at the coffee shop. It’s so easy to add this keto hot chocolate powder on the go and I love being able to have my own chocolaty treat while everyone else is drinking their sugary hot chocolate! Making this keto hot chocolate mix couldn’t be easier. You will be using heavy cream powder, granulated Swerve sweetener, confectioners Swerve sweetener, organic fair trade cocoa powder, salt, and cinnamon. The cinnamon is optional but highly recommended (it really helps round out the chocolate flavor)! Simply combine everything in a bowl (sifting the cocoa powder) and whisk to combine. This recipe makes the perfect amount of powdered mix to store in a quart size glass mason jar. 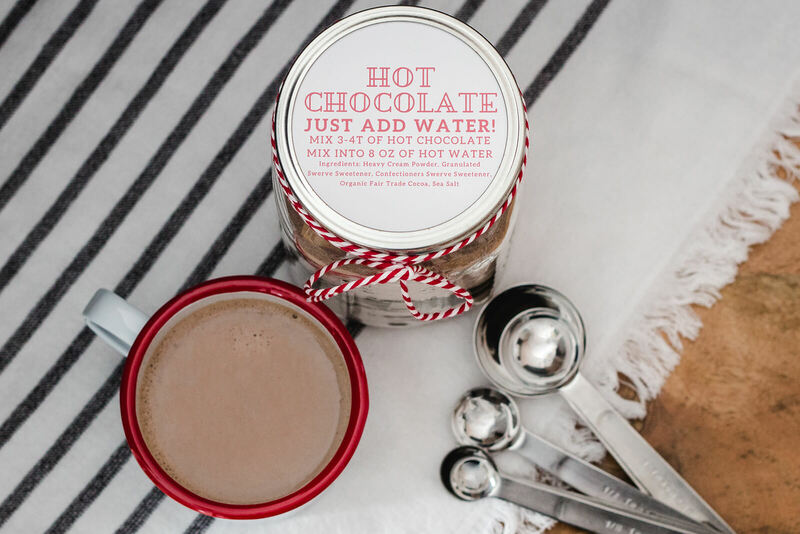 To make a piping hot delicious mug of this hot chocolate, bring 8 oz of filtered water to a boil. Add 3-4 Tablespoons of the powdered keto hot chocolate mix and stir or whisk to combine. Dairy Free Keto Hot Chocolate Mix: Substitute coconut milk powder in place of the heavy cream powder. Peppermint Keto Hot Chocolate Mix: Add 6-12 drops of high quality, food safe peppermint essential oil to the powdered mix and whisk to combine. Mocha Keto Hot Chocolate Mix: Add 1/4 Cup of instant espresso powder to the powdered mix and whisk to combine. Just want to make one mug into a mocha? I like to add 1-2 Tbsp of the keto hot chocolate mix powder to 8-10 oz of black coffee. WANT KETO SUGAR FREE MARSHMALLOWS TO PUT IN YOUR HOT CHOCOLATE? CLICK HERE FOR MY RECIPE FOR LEGIT KETO MARSHMALLOWS! 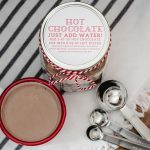 Make this easy keto hot chocolate mix to keep on hand so you can always make a delicious mug of low carb hot chocolate. Just add water! Combine all ingredients in a large bowl, sifting the cocoa powder. Whisk to combine. Store in a quart size glass jar, such as a Mason jar. Boil 8 oz of hot water. Carefully add 3-4 Tbsp of keto hot chocolate mix powder to the water and mix to combine. 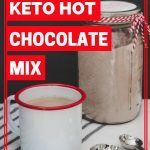 WANT TO SAVE THIS KETO HOT CHOCOLATE MIX RECIPE FOR LATER? CLICK HERE TO PIN IT TO YOUR FAVORITE KETO PINTEREST BOARD!